Ubisoft came to E3 with a chip on their shoulder with a hostile Vivendi takeover looming over them, so how did their E3 2016 Press Conference turn out? Ubisoft was the easiest company to map out among all of the others as the developer has cultivated a certain style and sense of predictability that makes them unique in this industry. We saw the expected titles like Ghost Recon Wildlands, South Park: The Fractured But Whole, Watch Dogs 2, For Honor, Eagle Flight, and The Division among the returning items on the agenda. We knew they had to be working on some smaller stuff and that’s where Trials of the Blood Dragon and Grow Up come into play. With VR just getting started, Ubisoft has to make some moves there with Star Trek: Bridge Crew being the highlight. For staff impressions and a trailer roundup, check out the bottom of the article for more. The follow-up to The Stick of Truth aims to keep the action going as the kids of South Park are tired of the Lord of the Rings stuff and have moved onto pretending to be superheroes in a spoof on Marvel vs. DC’s cinematic universe. The battle system has made some changes to incorporate a strategy RPG-style grid to move around and the ability to mess with the turn order with your farting skills. The coolest part is that those that pre-order get a free copy of The Stick of Truth on PC, PS4, and/or Xbox One with Steam people being able to get it right now if they choose to pre-order now. 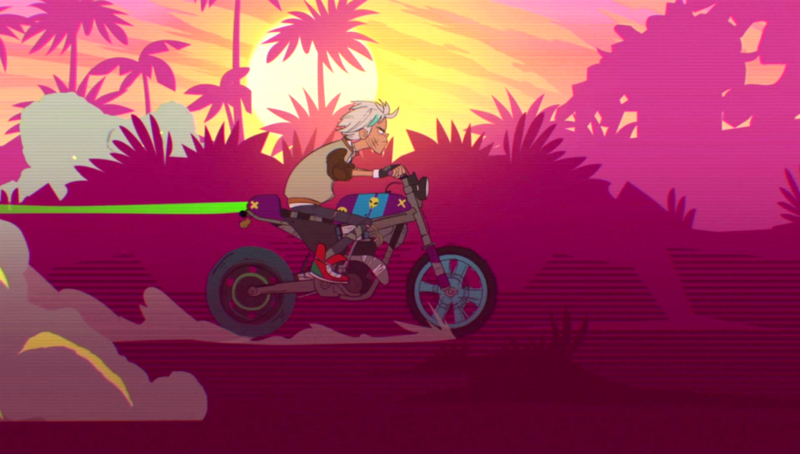 The newest Trials game is a mash-up with the style sensibilities of Far Cry 3: Blood Dragon that follows last year’s Trials Fusion: Awesome Max expansion for dumb fun spin-offs that takes that Trials formula in new directions. If that sounds cool, it’s out now on the platforms mentioned above right now for $14.99. Grow Home was a very successful small title from the folks behind the Driver series and it’s no surprise that we get a new installment where Bud has to get to the Moon. It looks like you’ll have a whole planet to explore, though the perspective in the trailer suggests that this planet is not that large. This was an easy win for one of their first VR games by translating the Star Trek bridge experience to VR. Up to four people team up to successfully pilot a starship around the galaxy by playing their roles and reliving some classic Star Trek moments that many of us have dreamed of doing one day. Snowboarding games have largely disappeared since last generation when Amped 3 and SSX were the last attempts to revive a dying genre, but Ubisoft has tapped a vein for a particularly cool style of game to offer. Offering several mountains to snowboard, ski, paraglide, or wingsuit down, this reminds me a bit of a current Steam game called Snow, but obviously expanded with online co-op, challenges, and a cool replay system to let you best capture your best and worst moments. After the original’s dubious start as an early next-gen title before the hardware was nailed down, Ubisoft certainly had their work cut out for them to make the sequel the game we hoped we would get the first time around. The combat and your tools to deal with it look better this time around and the world looks like it’s more fun to explore, which are important things to see this early on. Still, this could all change when we get to the final game. Yves made a heartfelt statement at the end of the show about how much Ubisoft as a whole values creativity and the independence to make what they think is best, which seemed like a big plea for support as Vivendi’s hostile takeover looms over them after Gameloft was surrendered to the media conglomerate a few weeks ago. As somebody who generally enjoys their work, this was cool to see in an industry where most of the big publishers just make what makes the most business sense. This game looked like it could be a cool flight exploration VR game back when we first saw it last year and since then, it has turned into a weird kart racing-style multiplayer combat game that isn’t very appealing in the end. I’m hoping this is just a side mode and not the focus, but they’ve obviously got other VR stuff that sounds like it’s more up my alley. The bits we saw of the Underground expansion looked like more of the same as somebody that needs more than that to get back into the game. Survival seemed like the better thing as it has a more interesting premise, but I can find little info to fully explain what it is. To be upfront, the game looks like it’ll be really good, but the gameplay demo they had during the press conference reeked of a fake co-op demo where the chatter and lingo of the people player are PR vets who are playing this mission in the perfect way while their “mistakes” are allowed to create “tension” that isn’t earned. This is the exact same thing that The Division received last year at E3, which comes off as a less genuine presentation than they probably intended. For Honor is totally not my thing, so I hope those that are interested enjoy it as much as their hearts desire. This presentation of the single player campaign this year and last year’s multiplayer demos have not resonated with me once, which sticks out like a sore thumb among the rest of their offerings like this should be a Namco or Koei Tecmo game instead.